HPI: A 28 year old man was referred to Illinois Retina Associates for blurred vision in his right and left eyes. The right eye was more severely affected. Vision was 20/20 in both eyes without correction. Intraocular pressures were normal in both eyes. Pupils were equal round and reactive. The eyelids and anterior segments were unremarkable. The right eeye was notable for an optic nerve pit and the right periphery showed 2 inferior areas of abnormal retinal appearance (Figure 1). the left eye had an unremarkable posterior segment exam (Figure 2). OCT through the lesion inferior to the optic disc showed an absence of normal retinal tissue associated with an outpouching of sclera (Figure 3). 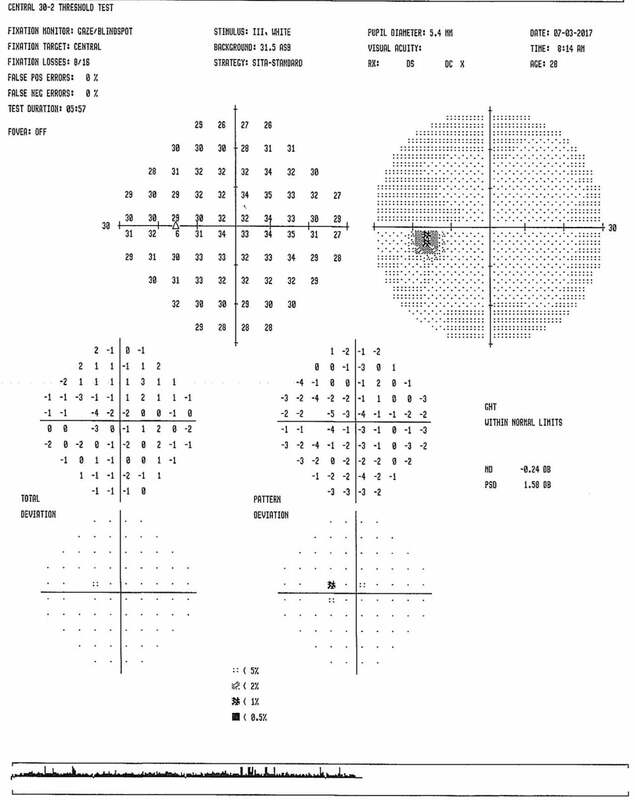 Additional cuts through the macula confirmed an absence of fluid in the macula. 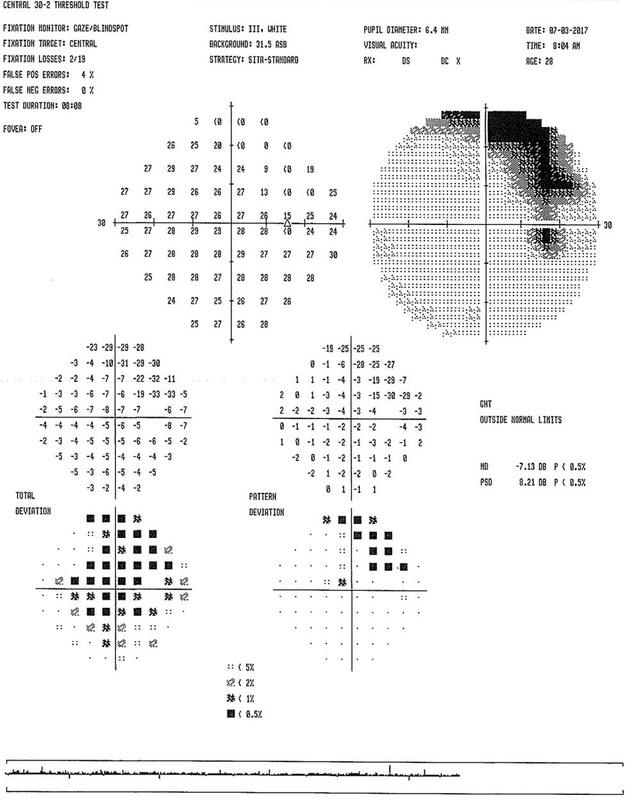 Visual fields showed a superior scotoma corresponding to the inferior lesion in the right eye (Figure 4) and the left eye showed a full field (Figure 5). 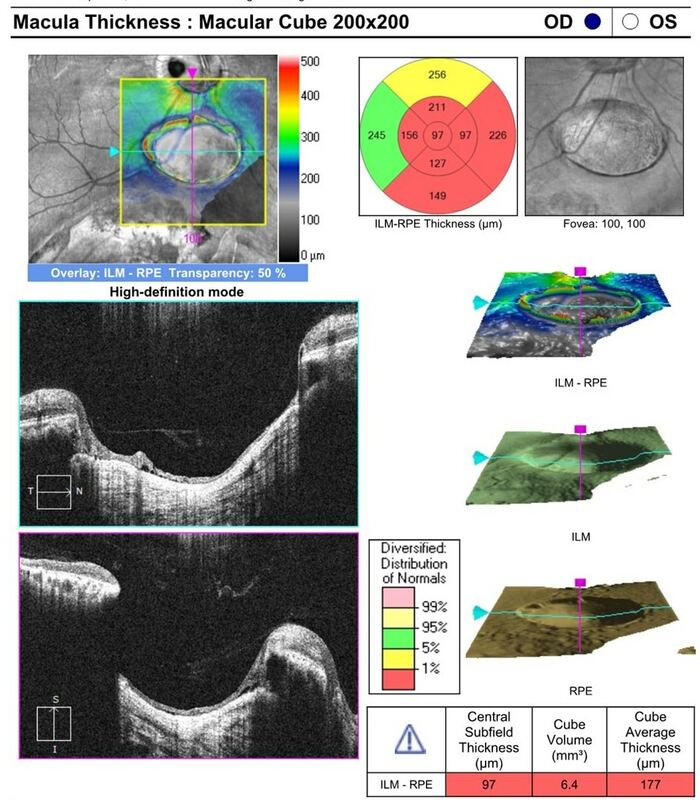 The OCT illustrating the absence of retina over the area of abnormal retinal appearance and the visual field showing the superior scotoma strongly suggest a diagnosis of retinochoroidal coloboma. Additionally, the area of abnormal appearance in the optic nerve is consistent with an optic nerve pit. These entities are known to coexist. Given the patient did not have any other systemic pathology, any of the syndromic associations with coloboma, were excluded. Optic nerve pits are excavations of the optic nerve head present from birth. They are believed to originate from incomplete closure of the superior and inferior embryonic fissures. Although benign by natures, the most frequent complication associated with optic nerve pits are serous retinal detachments which are thought to be due to liquefied vitreous gaining access to the subretinal space through the optic nerve pit. 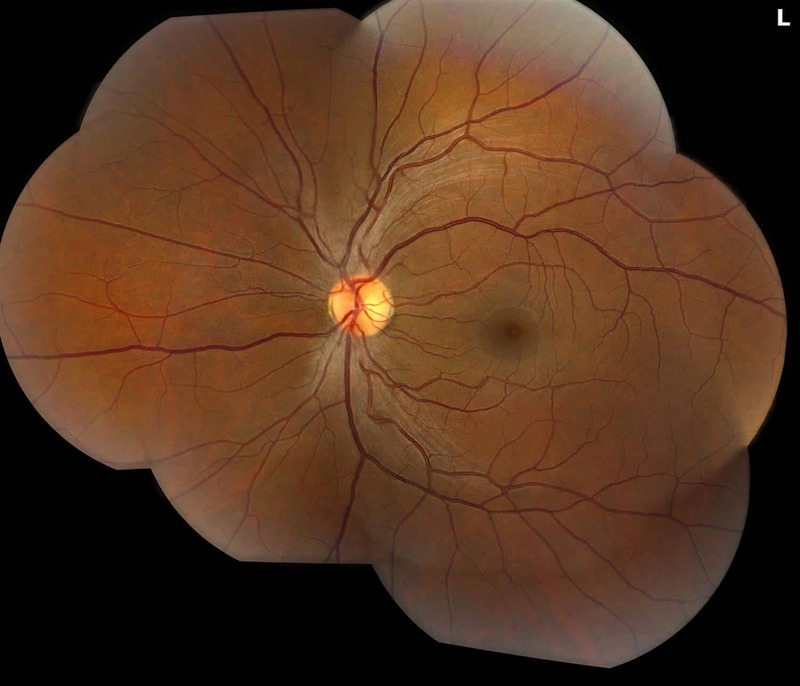 Such pits occur in about 1 in 10,000 eyes and 10% of optic nerve pits are bilateral. Optic nerve pits are associated with colobomas of the retina and iris. Retinochoroidal colobomas are caused by failure of the choroidal fissure to close. Depending on their location, they may be benign or associated with amblyopia, refractive error or visual field defects. They may also be complicated by choroidal neovascularization and retinal detachment. They may be unilateral or bilateral and may be associated with other developmental defects as part of a syndrome. 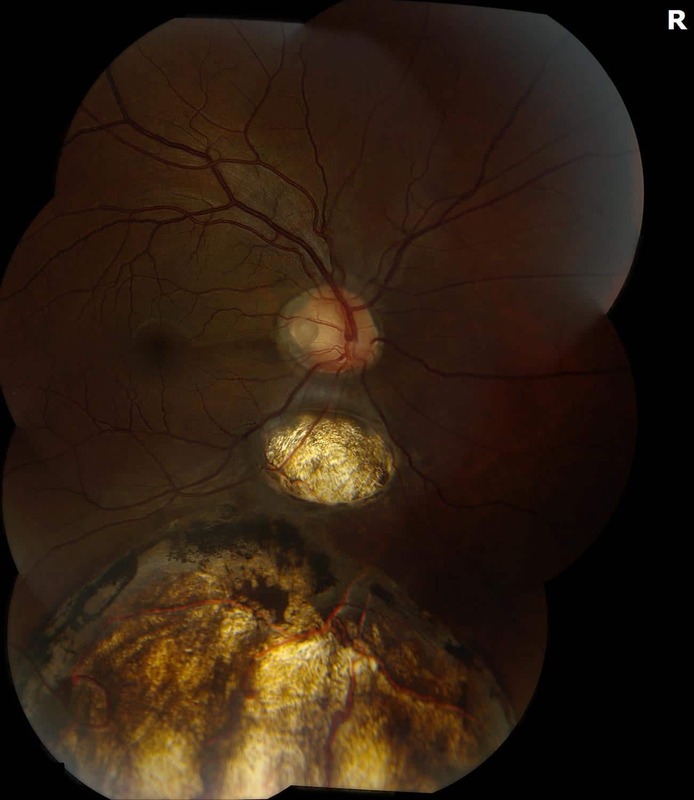 Combined optic nerve pits and retinochoroidal coloboma are a previously reported entity. They are believed to coexist because they originate from the same failure of fusion. As long as they are in the same eye, they are not known to carry increased risk of a systemic syndrome.